The bats are cold again as the Phils drop the series to the Astros as they lose, 3-2. The Phils’ offense has once again gone cold as they waste another good performance by one of their starters as they lose to the Astros, 3-2. The Astros took the lead in the fourth as, with two men out, Hunter Pence hits a solo home run, his twentieth home run of the year, giving the Astros a 1-0 lead. The Phils tied it up at one-all in the fifth as Jayson Werth hits a lead-off home run, his seventeenth home run of the season. The Astros retook the lead in the sixth as, with one man out, Michael Bourn hits a solo home run, making it a 2-1 Astros’ lead. The Phils retied it in their half of the sixth as, with two men on, and with one man out, Placido Polanco hits an RBI double, scoring Roy Halladay, who had earlier singled, and then went to second on Shane Victorino’s single, while sending Shane Victorino, who had earlier singled, on to third base. The Astros retook the lead again in the seventh as, with one man on and with two men out, Humberto Quintero hits an RBI single, knocking in Chris Johnson, who had earlier doubled, giving the Astros a 3-2 lead. The Phils tried to retied the game in their half of the seventh as they had runners on the corners, with Ben Francisco at third, after being safe on first on a 5-4 force out, as Mike Sweeney, who had earlier singled, was thrown out at second base, and going to third on Carlos Ruiz’s single, and with Ruiz on first, via a single, and with two men out, as Jimmy Rollins was batting, Quintero threw out Francisco with a quick snap throw to third, as Francisco lost sight of the bag. That would be the last real threat by the Phils as Brandon Lyon records his eighth save of the season in the ninth by striking out the side. Roy Halladay took the lost as he pitches seven innings, giving up three runs on six hits, while striking out three. His record is now 16-9 with a 2.22 ERA. Jose Contreras and Chad Durbin pitches two 1-2-3 innings, striking out two batters (one each). J.A. Happ gets the win as he pitches six and one-third innings, giving up two runs on five hits and two walks, while striking out four. His record is now 4-2 with a 3.45 ERA. Wilton Lopez pitched to one batter, giving up a hit. Tim Byrdak collects his eighth hold of the year as he pitches a third of an inning. Mark Melancon records his second hold of the year as he also pitches a third of an inning. Brandon Lyon records his eighth save of the year with two scoreless innings, giving up a hit, while striking out three. The Phils had only seven hits in the game, singles by Shane Victorino, Mike Sweeney, Carlos Ruiz, Roy Halladay and pinch hitter Ryan Howard, an RBI double by Placido Polanco and a solo home run by Jayson Werth. The offense is once again having a hard time scoring runs. The Phils (70-56, 2nd East) are concluding their series with the Astros (57-69, 4th Central) with an afternoon game, already in progress, with the Phils trailing. Roy Halladay pitches his 50th career complete game as he wins his 150th victory as the Phils sweep the Astros, 2-1. Roy Halladay, as he pitches his 50th complete game, wins his 150th career game as he outduels the Astros’ Ray Oswalt, as the Phils defeat the Astros’ 2-1. The Phils, now 5-1, are off to their best start since 1993, when they started that pennant season with an 8-1 start. The Phils took a quick 1-0 lead in the first as, on the second pitch of the game, Jimmy Rollins hits a solo home run, his first home run of the season. The Phils would make it 2-0 in the second as, with runners on the corners, and with nobody out, Carlos Ruiz hits an RBI ground out, 6-3, knocking in Raul Ibanez, who had earlier doubled and had gone to third on Shane Victorino’s single, while Victorino, who had earlier singled, moved up to second base. The game then became a pitchers’ duel between the Phils’ Roy Halladay and the Astros’ Roy Oswalt, with Oswalt giving up no more runs before leaving the game in the sixth, having given up two runs on five hits and two walks, while striking out eight Phils, while Halladay, through five, gave up only three hits while striking out five Astros. The Astros then threathen in the sixth as they loaded up the bases on singles to pinch hitter Chris Johnson and Michael Bourn, with Johnson moving up to second base, and an error to third base by Halladay on a bunt attempt by Jeff Keppinger, allowing Johnson to reach third, while Bourn moved up to second on the throw to third, with nobody out. But the next batter, Cory Sullivan then hits into a 6-3 double play, forcing out Keppinger at second base, while Johnson scored, making it a 2-1 Phils’ lead, while Bourn moved up to third, where he would stay as the next batter, Carlos Lee, pops up to Rollins for the final out of the inning. The Astros then threathen again in the seventh, as they put runners on second and third, with one man out, via singles to Geoff Blum and Pedro Feliz, with Blum moving up to second base on Feliz’s hit, and then with both man moving up a base on Kazuo Matsui’s sacrifice bunt, 2-4, for the inning’s first out. But Halladay then turned the Astros back by getting J.R. Towles to bounce back to the pitcher, 1-3, for the inning’s second out, and then striking out pinch hitter Jason Michaels, swinging. That would be the last threat as Halladay gets Feliz to end the game in the bottom of the ninth with a pop up to Chase Utley for the final out. Roy Halladay picks up the win as he pitches a complete game, giving up an unearned run on seven hits, as he strikes out eight. His record is now 2-0 with a reduced ERA of 0.56. Roy Oswalt took the lost as he pitches six innings, giving up two runs on five hits and two walks, while he strikes out eight. His record is now 0-2 with an ERA of 3.75. Jeff Fulchino, Tim Byrdak and Brandon Lyon combine for three shut out innings, giving up only one hit (Fulchino), while striking out two Phils (Fulchino and Byrdak, one each). The Phils’ offense had only six hits in the game, with Jimmy Rollins leading the team with two hits, a solo home run and a single, knocking in a run. Chase Utley, Raul Ibanez, Shane Victorino and Roy Halladay had the other foru Phils’ hits, with Utley and Ibanez’s hits being doubles. Carlos Ruiz knocked in the other Phils’ run with an RBI ground out. The Phils (5-1, 1st East) start a six games home stand with a three games series against the Nationals (3-3, 4th East). The first game of the three-games set, being played at Citizens Bank Park, is already in progress. The Phils send to the mound Cole Hamels (1-0, 3.60), who is coming off a win against these same Nats on April 7, as he pitched five innings, giving up three runs, only two of which were earned, on five hits and two walks, while striking out five, in the Phils’ 8-4 win. He hopes to improve on that outing, giving the Phils a chance to win their home opener. He will be opposed by Jason Marquis (0-1, 13.50), who is coming off a lost to the Phils, also on April 7, as he lasted only four innings, giving up six runs on eight hits and three walks, while striking out only two, in the Nats’ 8-4 lost. He hopes to do better against this same Phils squad. 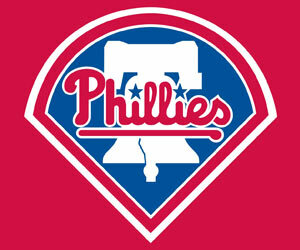 The Phils plan to win their home opener, and to increase their winning streak to four games.